Working with vocals can be a lot of fun when a computer does the speaking. Below is my recommendation of text to speech apps for iOS. Do you know of some that aren’t listed? Is so please comment below. iSpeech is a really simple cut and dry text to speech app. Not really designed for fun. More for practical purposes although they do have voices like Obama for example. Type in text and listen with the iSpeech App. iSpeech converts text to speech with the best sounding voices anywhere. Simply enter any text and iSpeech will instantly read the words. The iSpeech App is powered by the iSpeech.org Text to Speech (TTS) software as a service (SaaS) API. Enjoy the retro nostalgia of VOX 3000, a speech synthesis application complete with a custom green screen computer interface and keyboard. Type any collection of words on the loud over-sized keys and the VOX 3000 will say it for you to the best of its ability. *VOX 3000 uses a specially designed loudness maximizer to make the synthesized voice as loud as possible. *Save your favorite phrases in the phrase bank for use again later. 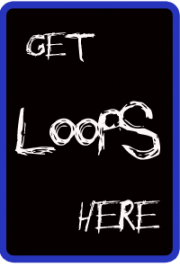 *Copy phrases to the clipboard so that you can paste them into AudioPaste compatible apps (e.g., FourTrack). Waldorf Attack has a Phrase Vocoder, a vocoder that uses written text instead of spoken words. Lyrics in – song out, adjust gender as you have always wanted. It’s a bit more complicated to use BUT the results are outstanding. It’s much more than just a text to speech synthesizer hence the price. Waldorf Nave is a very powerful synthesizer hence the price that comes with a killer text to speech synthesizer. It’s a little bit of a learning curve but well worth it. Realbeat is a fun sampler for iSO that also has a speech to text feature. Record your voice, your fridge, your neighbour’s dog or let your iPhone or iPad speak and make rhythms out of the sounds immediately. It’s very simple to use. 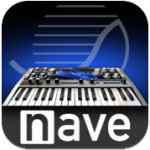 Nave is Waldorf’s first synthesizer App development – created by chief engineer and director Stefan Stenzel, NLog mastermind Rolf Wöhrmann and Design Guru Axel Hartmann. The Nave sound engine includes two novel Wavetable oscillators, leaving every previous attempt in wavetable synthesis far behind. The spectrum of a sound can be transposed independently of its pitch. The waves are being rendered periodically to noisy. Especially sounds with an accent on formants can be reproduced easily, which made us integrate a speech synthesizer for the easy creation of wavetables. The clearly structured UI invites both beginners and advanced users to experiment, and the large display of the iPad makes Wavetable creation and editing a blast. Besides Speech Synthesis, Wavetables can also be made by analysing audio files. Further stretching, rotating and shifting in spectral domain allows Wavetables to be further refined or distorted. All factory Wavetables from Microwave, Wave and Blofeld are included, complemented by new ones that make extensive useof the enhanced possibilities. In addition to the Wavetable Oscillators, Nave offers an oscillator module featuring the novel Überwave that can fatten your sound by up to eight detuned oscillators. The filter offers the familiar outstanding Waldorf sound, featuring lowpass, bandpass and highpass with either 12dB or 24dB slope. The Drive section offers different characteristics, and it can be positioned in the signal path: before or after the filter, or as a summing overdrive before or after the equalizer – for those who prefer harsh screaming sounds over delicate Wavetable sweeps. An extended modulation matrix and diverse real time control functionality is waiting for animating Nave sounds in any desired direction. Besides the classic virtual chromatic keyboard, Nave can be played with the “Blades” that allow for dynamic triggering of polyphonic modulation by sliding the fingers in x or y direction. The 4-track recorder can be used to build your own Nave songs or to simply sketch your music, inspired by the sounds of Nave. 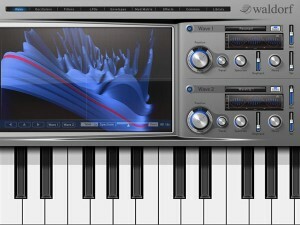 I am very excited to hear about this new Waldorf synth coming for the iPad. I’ve been a fan of Waldorf ever since the original Q series. Will be nice to have their wicked wavetables on an iPad. Thanks to intelligent gesture recognition and plenty of available graphic performance the iPad is perfect for bringing wavetable synthesis to a new level. For the first time it will be possible to plunge into the depths of wavetables and to make their sound content visible with advanced 3-D technology. The cooperation between Waldorf and TempoRubato, also known for their product line NLog Synth, doesn’t stop here: The application will also offer new possibilities for sound manipulation based on Waldorfs very latest spectral research. An innovative approach to wavetable synthesis allows for the transposition of the spectrum and the balance of periodic and sound spectra entirely independent from a wave’s position. The existing wavetable technology is thereby extended by two new dimensions, and it allows for formant shifts as well as numerous other unheard sounds. Also, unlike with typical wavetable instruments, the number and length of waves in a wavetable will no longer be restricted. Itís the era of wavetable synthesis V2.0! This app will support a huge number of hardware MIDI interfaces, e. g. all Core MIDI compatible interfaces by IK Multimedia, iConnectMIDI, MIDI Mobilizer II by Line6, ioDock or the Camera Connection Kit by Apple, as well as proprietary interfaces such as the SynthStation by Akai. App collaboration standards like Sonomas Audio Copy/Paste, Intuas Audio Pasteboard and Virtual Core MIDI will also be supported like the upcoming AudioBus standard and KORGs WIST synchronization technology.